NEY have been the supplier of veneer / laminate presses and replacement platens for over 25 years. We have a wealth of specialist knowledge within the company in terms of specifying the correct machine for particular situations. In addition we can offer practical advice on application and production techniques as well as suitable adhesives for the individual application. Depending on the production we can offer single daylight, multi-daylight or through-feed options with either cold, electric or oil heated options. Built on exactly the same principles as single daylight machines multi daylight presses offer increased capacity due to the ability to press multiple panels and still achieve short cycle times. Normally when more than one intermediate platen is added the total daylight (the maximum opening of the press) is increased to allow room for the platens without limiting the space between each platen. It is possible within obvious limits to add one or two additional platens to an existing press as production requirements increase therefore eliminating the need to change or add a machine. When working with smaller parts a press with an automatic loading system can offer many advantages. 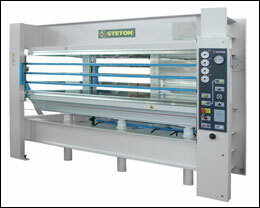 Often, depending on panel size, it is possible for a press to be operated by a single person rather than the two normally associated with a single or multi daylight machine. In this instance automatic loading and unloading enable lay up, positioning and final unloading to take place whilst a set of components is being pressed, therefore offering major time savings. Additionally the loading and layout of the panels takes place outside of the press away from the platen. This avoids the pre-curing of the glue and curling of veneers which will improve the bond and quality of the finished panel. For higher volumes of production a through feed press will maximise output. Normally this type of press is integrated into complete lines with automated feeding and stacking. We are able to offer both longitudinally and laterally fed presses to suit production layouts. Customers can find that a laterally or cross feed press can be accommodated into a factory layout more easily as the overall line length is shorter. With a through feed line the platens are usually solid drilled and oil heated as the heat recovery time is shorter and a more stable temperature can be achieved even with high through-put.